This article is featured in the March 2019 issue of College Planning & Management magazine. WiFi networks, the Internet of Things (IoT), and other advanced technologies have enabled colleges and universities across the country to transform into digitally connected campuses that are benefiting students, faculty, and their surrounding communities. As a result, these modern-day campuses boast enhanced student learning and quality of life, lower operating costs, greater security and safety, improved environmental sustainability, and more. Smart campuses, like smart cities, are defined as places where devices and applications create new experiences or services and facilitate operational efficiency. The number of smart campuses may grow faster than smart cities, as Digital Native students expect online connectivity in their learning and social environments. The idea of digitalizing campuses is also favored by school officials continually searching for new ways to improve the experience for students academically and socially, along with mitigating security and environmental issues as well as reducing spiraling operating costs. The integration of digital technology into the learning process has given students more options than ever before to decide where, when, and how they pursue their studies. For example, students can use their smartphones and other mobile devices to gain access to homework assignments and grades through online portals, or they can attend classroom lectures remotely through the use of video technology. IoT devices are being used to send alerts about students skipping classes, allowing school officials to help those who may be struggling academically. Network computing technology has made campus life much easier for today’s students, such as location-based systems to find lost textbooks and other personal items; using a digital device to pay for meals at a self-service cafeteria; or finding the time, location, and cost of various student activities. Arizona State University’s football stadium has installed sensors and cameras to improve operating efficiency and entertainment value for fans crowding into the stadium, which is undergoing a $300-million-plus renovation. The technology now allows the university to gather information that measures water usage, finds restrooms in need of plumbing repairs, monitors the rate of concession sales to get a better gauge on demand for food and beverages and even assesses noise levels to determine the loudest fans in cheering contests. The University of Texas at Austin runs the largest microgrid in the country, providing all of the electricity, cooling, and heat for the school’s 20,000,000-square foot campus with 150 buildings. The university has expanded the facility over the years to accommodate growing energy needs. The use of WiFi and IoT technologies has made great strides in providing greater campus security and safety in recent years. Networked video cameras, digitalized LED lighting systems, digital identification card readers, geofencing, and other technologies are being employed on many academic campuses. Colleges and universities are jumping on the autonomous vehicle bandwagon in order to reduce traffic congestion, increase road safety for drivers and pedestrians, and lower carbon emissions from gas-powered vehicles. At the University of Wisconsin-Madison, plans call for the installation of sensors on traffic lights on a designated road to create an autonomous vehicle testing zone. The University of Michigan also has built a 32-acre testing site for self-driving vehicles. College instructors pacing back and forth while speaking to students seated in big lecture halls—the “sage on a stage”—is becoming a thing of the past. Virtual labs, digital ports, remote learning, and other technological advances are making it easier for students to learn beyond the traditional classroom environment while giving their instructors new and better teaching tools and methods, as well as greater reach outside a single classroom. Tecnologico de Monterrey (Tec) in Mexico serves as a classic example of how technology is taking higher-education institutions into the digital age and changing the pedagogical landscape. The modernization plans of Latin America’s largest university resulted from a decision to rebuild the University’s Mexico City campus in the aftermath of a major earthquake that struck the city in 2017. The powerful earthquake killed thousands and destroyed dozens of buildings in the city, including virtually all of the buildings on the Tec campus. 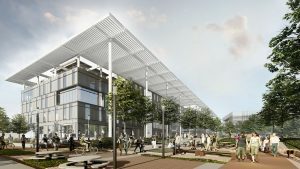 Rather than simply replace the destroyed school buildings with similar structures, an unprecedented opportunity arose to build a campus from scratch that would accommodate Monterrey Tec’s new teaching methodology, migrating from a traditional educational model to a challenge-based, active learning environment. To accomplish that goal, this massive rebuilding project required classrooms to be more flexible and collaborative by combining inventive architectural design with state-of-the-art technology. The school’s library, one of three buildings to be completed in the project’s first phase, will bear little if any, resemblance to the old one. The library, which will be built in the center of the campus, will no longer be a building just filled with books. It will be designed as a technology innovation hub that reinforces the school’s new teaching model of fostering greater interactive learning and creativity, and it will reactivate the center of campus. The rebuilt campus will also promote a greater sense of safety and security among students, their parents, and the city’s residents. This was an important consideration in the project’s design, as the former campus was surrounded with heavy masonry walls that largely hampered the community’s ability to feel connected to Tec. The new campus design will be woven more into the fabric of the community, creating more transparency while maintaining security. 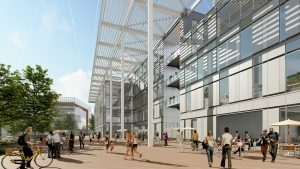 To create a more open and secure environment, part of the project’s master plan calls for the construction of glass buildings and digital devices that increase visibility and surveillance of the campus. This will offer increased student safety and enhance the university’s interaction with the community. The redesign of the Tec campus not only facilitates the necessity for flexibility and technology that their new pedagogy requires, it also promotes resiliency and branding. Universities and colleges resemble small cities; each has its own infrastructure that must be regularly maintained in order for operations to run as smoothly as possible. But that comes with an ever-increasing price tag, making it very difficult for schools to avoid initiating tuition hikes and cost-cutting measures on academic, sports, student life, and other programs. Smart technologies, however, enable schools to operate more efficiently. This, in turn, allows them to continue to meet rigorous academic standards and, at the same time, to keep tuition and other costs as low as possible. One of their biggest operating costs is energy and water consumption. A number of schools have installed smart technology into building control systems and renewable energy programs that have increased efficiencies in these areas, producing significant cost savings. For example, the University of Washington has installed more than 2,000 sensors at its Seattle campus to monitor energy consumption, resulting in a projected return of several dollars in savings for every dollar invested in the technology. Pacific Lutheran University, a private school in Tacoma, WA, has reduced its energy costs by using IoT devices on its heating and air-conditioning system and doors on campus buildings that measure the number of students entering and leaving buildings. And schools like The University of Texas have or are building their own microgrids to reduce energy costs and lessen their dependence on other power sources. Higher education institutions, of which there are more than 4,000 public and private colleges and universities in the U.S. alone, must adopt smart campus technologies in order to continue to offer topnotch, cost-efficient educational programs in this competitive market. This approach will allow today’s students to meet the demanding challenges that lie ahead in the increasingly digitalized society of the 21st century.